We are looking for volunteers from across the UK and Northern Irela nd who are passionate about raising awareness and improving survival for pancreatic cancer to support us in our work. Raising the profile of pancreatic cancer within your local area is a fantastic way to help and we really appreciate all the support you can give. What is a Community Volunteer? 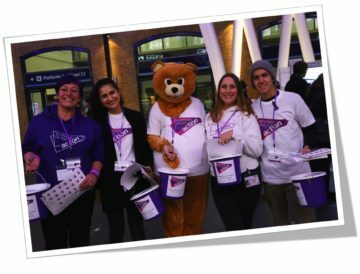 A community volunteer means you will become an ambassador for Pancreatic Cancer Action by supporting our fundraising campaigns and helping to spread awareness about the signs and symptoms of pancreatic cancer in your community. 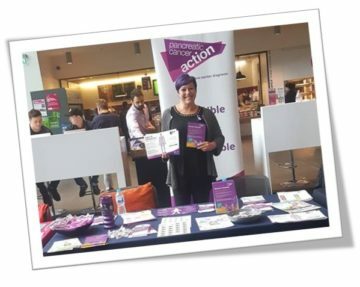 You could be representing Pancreatic Cancer Action when talking to people whether it be community organisations, schools or local businesses. We will support you with everything that you need to develop in your role. We will provide awareness and fundraising materials, practical advice and the opportunity to meet other reps to swap ideas! Holding awareness stands and occasionally giving short talks. Attending cheque presentations and thanking fundraisers in person on behalf of PCA. Promoting your contacts to take part in our bespoke events and challenges such as Striding for Survival and the Cotswolds Way. Research ‘Charity of the Year’ opportunities in your local area. Most businesses, schools, churches and community groups adopt a Charity of the Year. You can view the full role description here. or call on 0303 040 1770 during office hours.